jīvan—while living; śavaḥ—a dead body; bhāgavata-aṅghri-reṇum—the dust of the feet of a pure devotee; na—never; jātu—at any time; martyaḥ—mortal; abhilabheta—particularly received; yaḥ—a person; tu—but; śrī—with opulence; viṣṇu-padyāḥ—of the lotus feet of Viṣṇu; manu-jaḥ—a descendant of Manu (a man); tulasyāḥ—leaves of the tulasi tree; śvasan—while breathing; śavaḥ—still a dead body; yaḥ—who; tu—but; na veda—never experienced; gandham—the aroma. The person who has not at any time received the dust of the feet of the Lord’s pure devotee upon his head is certainly a dead body. And the person who has never experienced the aroma of the tulasī leaves from the lotus feet of the Lord is also a dead body, although breathing. According to Śrīla Viśvanātha Cakravartī Ṭhākura, the breathing dead body is a ghost. When a man dies, he is called dead, but when he again appears in a subtle form not visible to our present vision and yet acts, such a dead body is called a ghost. Ghosts are always very bad elements, always creating a fearful situation for others. Similarly, the ghostlike nondevotees who have no respect for the pure devotees, nor for the Viṣṇu Deity in the temples, create a fearful situation for the devotees at all times. The Lord never accepts any offering by such impure ghosts. There is a common saying that one should first love the dog of the beloved before one shows any loving sentiments for the beloved. 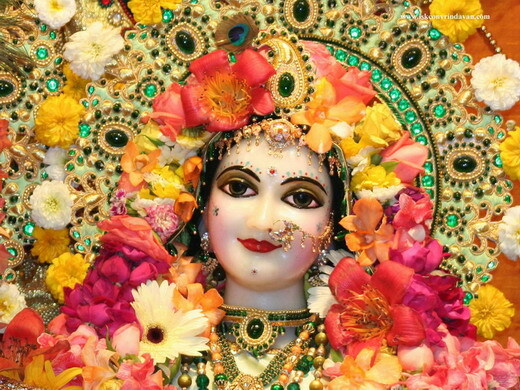 The stage of pure devotion is attained by sincerely serving a pure devotee of the Lord. The first condition of devotional service to the Lord is therefore to be a servant of a pure devotee, and this condition is fulfilled by the statement “reception of the dust of the lotus feet of a pure devotee who has also served another pure devotee.” That is the way of pure disciplic succession, or devotional paramparā. In other words, Lord Śrī Kṛṣṇa is the property of His pure unconditional devotees, and as such only the devotees can deliver Kṛṣṇa to another devotee; Kṛṣṇa is never obtainable directly. Lord Caitanya therefore designated Himself as gopī-bhartuḥ pada-kamalayor dāsa-dāsānudāsaḥ [Cc. Madhya 13.80], or “the most obedient servant of the servants of the Lord, who maintains the gopī damsels at Vṛndāvana.” A pure devotee therefore never approaches the Lord directly, but tries to please the servant of the Lord’s servants, and thus the Lord becomes pleased, and only then can the devotee relish the taste of the tulasī leaves stuck to His lotus feet. In the Brahma-saṁhitā it is said that the Lord is never to be found by becoming a great scholar of the Vedic literatures, but He is very easily approachable through His pure devotee. In Vṛndāvana all the pure devotees pray for the mercy of Śrīmatī Rādhārāṇī, the pleasure potency of Lord Kṛṣṇa. Śrīmatī Rādhārāṇī is a tenderhearted feminine counterpart of the supreme whole, resembling the perfectional stage of the worldly feminine nature. Therefore, the mercy of Rādhārāṇī is available very readily to the sincere devotees, and once She recommends such a devotee to Lord Kṛṣṇa, the Lord at once accepts the devotee’s admittance into His association. The conclusion is, therefore, that one should be more serious about seeking the mercy of the devotee than that of the Lord directly, and by one’s doing so (by the good will of the devotee) the natural attraction for the service of the Lord will be revived.